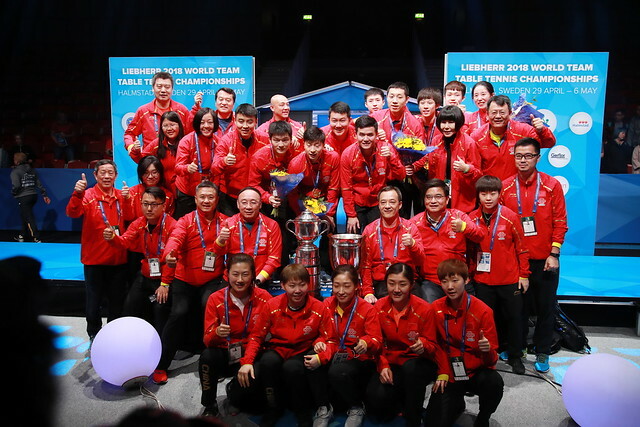 China the top seeds in the Women’s Championship Division concluded the opening day of play, Sunday 29th April, unbeaten; it was the same for Japan, the second seeds as it was for Hong Kong, the fourth seeds. However, for Chinese Taipei, the third seeds and bronze medallist two years ago in Kuala Lumpur, there was defeat. Meanwhile, for the host nation, hopes of a coveted top 12 finish remained open; for India, the recently crowned Commonwealth Games champions it was a complete reversal of the fortunes experienced two weeks ago on Australia’s Gold Coast. China took no prisoners, they posted three-nil wins against India and Belarus, likewise there were two wins for Singapore but they were harder fought. A three-two success against Sweden started the day, a three-nil win in opposition to Russia concluded the day; Russia having in the morning session of play accounted for Belarus by three matches to two. Star of the day was Matilda Ekholm; against Singapore she beat Yu Mengyu (7-11, 12-10, 11-4, 6-11, 12-10) and (3-11, 7-11, 11-8, 11-7, 11-7). In opposition to India she accounted for Mouma Das (13-11, 11-5, 11-7) and Manika Batra (11-6, 11-9, 11-3). Convincing wins were the order of the day. Japan was never troubled; they recorded three-nil wins against both Ukraine and Egypt. Similarly, Austria remained unbeaten; they accounted for the United States three-nil before recording a three-one success against Hungary. The player to set Austria on the victory path against Austria was Sofia Polcanova; she beat Dora Madarasz in a match that must be a contestant for the closest fifth game this century (11-8, 3-11, 8-11, 11-6, 21-19). Alas for both the United States and Egypt, it was a day without success; in the morning session of action Egypt had suffered a three-nil defeat at the hands of Hungary. In the evening session, the United States experienced a similar margin of defeat when facing Ukraine. Six fixtures completed only DPR Korea remained unbeaten; in their opening contest they beat the Netherlands three-one; before despite the efforts of Cheng I-Ching, they recorded a three-two win against Chinese Taipei. Cheng I-Ching beat both Cha Hyo Sim (12-10, 6-11, 11-6, 11-7) and Kim Song I (13-11, 11-9, 11-9). Earlier Chinese Taipei had recorded a three-one win against Poland, whilst by the same margin, Romania had accounted for the Czech Republic. Later, as the day concluded, the Netherlands beat Romania by three matches to one; Poland recorded a three-two success against the luckless Czech Republic. Hong Kong asserted authority recording a three-one win against Thailand followed by a three-nil success against Brazil. Similarly, it was two wins for Korea Republic. A three-nil win in opposition to Luxembourg started the day followed by a three-two success against Germany with Jeon Jihee the backbone of the win and Suh Hyowon the heroine. Jeon Jihee beat both Sabine Winter (11-4, 13-11, 11-7) and Petrissa Solja (11-6, 11-7, 12-10) to set the scene for Seo Hyowon the perform heroics. In the vital fifth match of the fixture, she recovered from a two games to nil deficit to beat Sabine Winter (7-11, 4-11,12-10, 11-8, 11-8). The defeat for Germany came after a three-nil win had been posted against Brazil; in the one remaining fixture of the day, Thailand recorded a three-two against Luxembourg to keep main draw hopes alive.